BrainBOK PMP® flashcards and CAPM® flashcards deck is the most comprehensive that you'll find for PMP® and CAPM® certifications. They cover almost every project management topic that you need to know for the exams. Our students tell us that these cards double-up as study notes. The ability to search for terms across the flashcards makes the tool even more powerful. Not only can you bookmark cards for review, but also view the top-bookmarked cards by other users. Review cards by Topics, Process Groups, Knowledge Areas, or Difficulty Level. Bookmark important cards for review later and access them with one-click from the Flashcards tab. Review the most bookmarked (top-rated) cards by other users across the system. The number of bookmarks is a good indicator of the importance of a topic for the exam. You can perform a keyword-based search across all 2000 cards to quickly find the cards matching the topic of your interest. Mark cards as correct / incorrect as you review them and access them with one-click from the Flashcards tab. 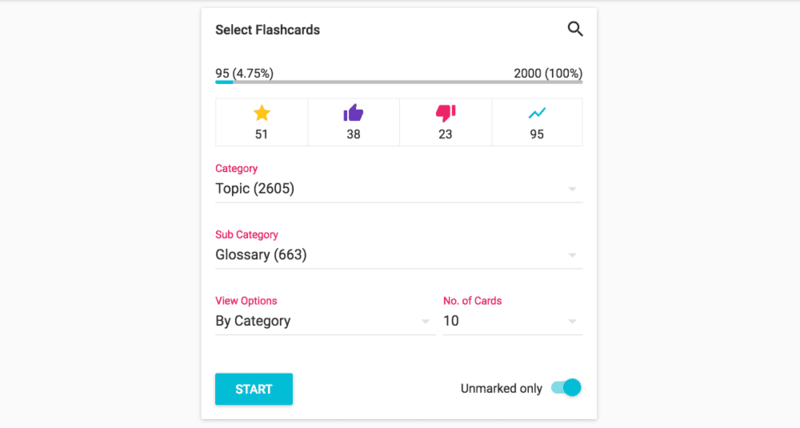 The progress bar at the top of the Flashcards tab shows your overall progress at a quick glance, and a detailed progress report with charts lets you track your progress by individual topics. Use your keyboard to navigate back and forth, bookmark cards, mark them correct or incorrect, or jump to the first or last card quickly. Select the number of cards to review at a time. Have 5 minutes before your next important meeting? Go for a quick bite of 10 cards! We are constantly listening to feedback from our students and improving our content. Every comment is reviewed by our content experts. The flashcards are organized by topics, process groups, knowledge areas and difficulty level. We have 2000 flashcards in the system. However, we are adding more cards as and when we find more relevant topics for the PMP® and CAPM®. So, this is a live database of cards and will continue to grow. No. Most of the content in BrainBOK is dynamically generated, and cannot be downloaded or printed. It is meant for online use only. Any card that you bookmark, mark correct, or mark incorrect counts toward your overall progress. Any unmarked cards are considered not reviewed. The horizontal progress bar at the top of the Flashcards tab shows your overall progress in numbers and percentage. The objective is to have all 2000 cards marked correct before your exam. No, we do 'not' offer the flashcards in hard-copy or PDF format. Most of the content in BrainBOK is dynamically generated, and cannot be downloaded or printed. It is meant for online use only. The cards that are starred (bookmarked) by most number of users are the top-bookmarked cards. Any time a user stars a card, it is counted as a +1 toward the rating of that card. Eventually as more and more users star the cards, the most-important, and best quality cards would rise to the top. We encourage you to make the good use of this feature. When you bookmark (star) a card, or mark it as correct (thumbs up) or incorrect (thumbs down), it is considered 'marked' or reviewed. When the 'Unmarked only' option is enabled (which is the default), 'marked' cards are not shown. This option is designed to allow you to review all the cards without having them repeat multiple times. So as you go through the cards, mark each card as correct or incorrect (or simply bookmark it) so that it doesn't repeat. This way the system would know that you have seen the card before and would not present it again. When you want to see all cards including the 'marked' ones, simply toggle OFF the 'Unmarked only' option. If you spot a problem - inaccurate information, typos, grammatical mistakes, layout problems, etc. - with any flashcard, use the 'Send Feedback' button available at the bottom right corner of the flashcard. You do not need to type the content of the card. The system automatically does that in the background. All you need to do is to type the problem and hit the Send button. For further queries, refer to our FAQ page.